Here you can find description of very simple but technically interesting hack. You can provide your own MMS Center (MMS=Multimedia Messaging Service) in GSM network instead of the operator's one. There is only a limitation of a bearer data service - MMS is usually run over GPRS (General Packet Radio Service) channels while you cannot behave as GPRS callee in GSM network. Fortunately MMS can be run also over CSD (Circuit Switched Data - up to 14400bps) or HSCSD (High Speed CSD - up to 57600bps) services. GPRS is usually known as always-online while CSD/HSCSD you must dial some destination number. GPRS vs. CSD have usually also different GSM operator tariffication but it should not matter much for the short data messages. I did not provite a completely mine MMS center. I was involved in pilot MMS Center project where some compatibility issues of MMS message format between MMS phone and MMS center had to be solved. 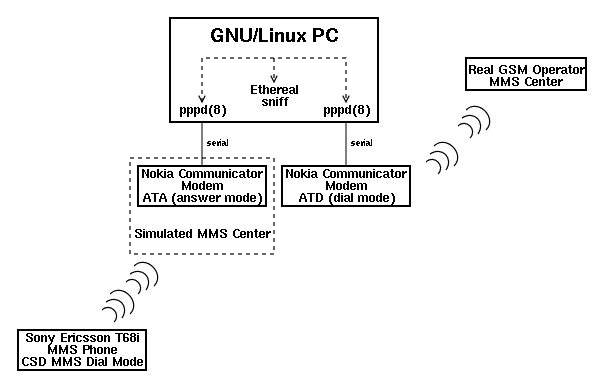 As I did not have technical access to the MMS center itself I setup two mobile phones (Nokia Communicators) to setup sniffing tunnel. 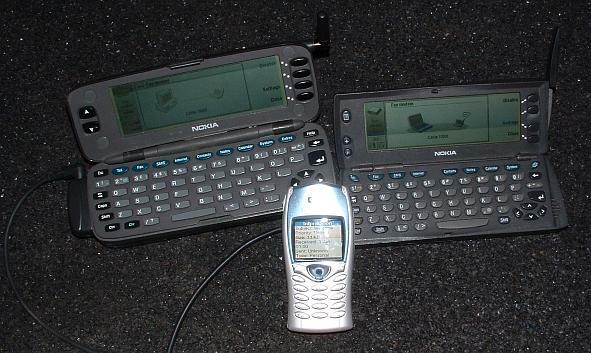 One of the phones were setup in answer mode to simulate the MMS center while the other one called to the real official (and buggy) MMS center accessible as regular service provided by the GSM operator. TIMEOUT 3 "" "ATZ" "OK-ATZ-OK" "" ABORT "BUSY" ABORT "NO CARRIER"
ABORT "NO DIAL TONE" ABORT "ERROR" ABORT "VOICE" REPORT CONNECT ""
TIMEOUT 90 CONNECT "" ^M ""